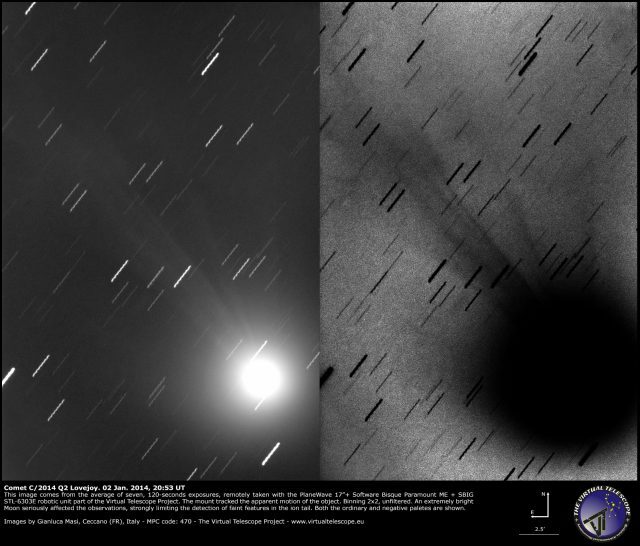 On 2 Jan. 2015, the sky was still clear and at Virtual Telescope we planned another imaging session of comet C/2014 Q2 Lovejoy. The Moon was truly extremely bright, producing so bad conditions that generally no one does images in such a situation. But the presence of such a bright comet was a big temptation and, looking at the results, the attempt was well worth the effort. The image above comes from the average of seven, 120-seconds unfiltered exposures, remotely collected with the PlaneWave 17″+Paramount ME+SBIG STL-6303E robotic unit part of the Virtual Telescope Project. The telescope tracked at the apparent rate of the comet. The object was at about 31 deg. of altitude above the horizon. The Moon was an extremely severe issue, also because only 30 degrees apart from the comet and high on the South.